The castle and buildings inside the fortifications as they stand today were erected in the 13th century by John Dudley. They are sited on the ground of the original motte and bailey castle, build soon after the Norman Conquest. During the Civil War, Parliament ordered the breaking down of the castle defences and further decline was due to a fire that ravaged residential buildings in 1750. 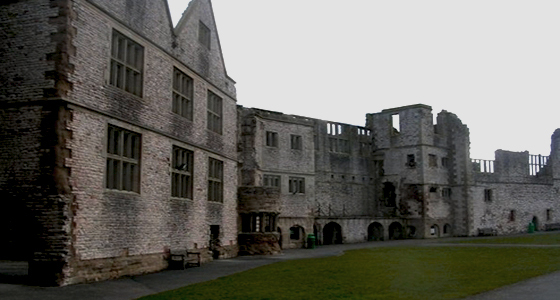 Rachel : I stayed at the castle overnight with a group of paranormal researchers; recording with people I did not know was fraught with tension and difficulties. Those I was placed with felt that silence and stillness was required to encourage and witness phenomena, my experience has suggested the exact opposite. It wasn't until I parted from the group, that I captured evidential EVP. The weather was cold with a fair wind, which made recordings outside quite difficult but the voices I later captured inside buildings more than made up for those lost on the ramparts. I would welcome the opportunity to return to Dudley Castle as it has an exceptionally interesting collection of buildings with a great potential for EVP recording. EVP 1: Might this be a reference to Simon de Montford, a French-English nobleman, who died on the battlefield at Evesham in 1265. Only some parts of his mutilated body were able to be buried; Baron Roger Mortimer sent Simon's severed head as a gift to his wife. EVP 2: Rachel calls out in French to Roger de Somery, asking him to say his name. Roger inherited the feudal barony of Dudley in 1235. EVP 3: Rachel is talking with a member of the team, saying where they had left unexpectedly. The exclamation of "My God" in French is from an unknown speaker. EVP 4:Rachel was alone at this point and was making idle chit chat to remain awake; it was true that her harp was dusty and in need of a clean. EVP 5:This clip was captured high on the battlement staircase, wind noise was inescapable. Although uncomfortable to listen to, this clip is interesting because of the sad message.